Does your child refuse to eat vegetables or fruits ? Then you are on the right page. In this article you will learn How you can encourage your children to eat vegetables, making vegetable art for children, tips to add more fruits & vegetables in child diet, some healthy ways to make quick vegetable snacks for your kids, Vegetable Games for Kids and all what you need to make your child eat fruit and vegetables. Healthy and nutritious food is very essential for maintaining a good health especially for the growing kids. A good healthy diet involves regular and timely food, juices, lots of vegetables and fruits, healthy snacks and much more. We all know that vegetables and fruits are good for everyone especially for kids but most of the kids do not like to eat vegetables at all. My kids also do not like to eat vegetables and fruits so I tried some interesting ways to turn my kids into a veggie lovers. There are lots of methods and tips which you can use to present the healthy side of eating the vegetables in front of your kids. It is good to teach your kids the importance of eating vegetables to instill in them a lifelong habit of eating and enjoying their greens. It is not compulsory that your kids hate all vegetables and fruits so offer them different types of foods to see which kind of food they love to eat and enjoy, especially fruits and vegetables. •	First of all you need to take care of your eating habits as the child learn from his parents, if you enjoy eating vegetables and fruits in the same way your child will do. Do not force your kid for eating vegetables as it can kill the child's willingness to eat vegetables. Eat fruits and vegetables with your child to set a good example in front of him. •	Colorful presentation of vegetables and fruits will encourage your child to try them. Kids love colors so cut the different colored vegetables (boiled or raw as required) and mix them with macaroni and cheese or other favorites, I am sure your kids will become curious to try them. Do not be stick only green color fruit or vegetable, every fruit and vegetable has some nutritional values so make a colorful presentation of all them so that your kids can enjoy the colors and flavors. Give them carrot sticks, cherry tomatoes, strips of bell pepper, rounds of apple and banana to eat so that they can have the nutritional values of all. Serve vegetables with a dipping sauce such as ketchup, sour cream or yogurt or any other dip liked by your kids. •	If you kids do not love to eat fruits than make them drink it, you can also make smoothies just mix fruit juice with different kind of fruits, add a little ice cube and jus mix them in the blender to make tasty and healthy smoothies. Same you can do with the vegetables, you can make the juice of carrots, beetroot, tomato, cucumber and many other vegetables. Present the juices with beautiful decorations in attractive glasses. •	You can make muffins or cakes with your child favorite vegetables just add pumpkin, zucchini or shredded carrots to the muffin or cake mix. I am sure your kids will love to eat this vegetable cake and you will become relax that your kids get benefits of vegetables. •	You can also prepare the deserts with using vegetable, soups are good for health so make the vegetable soups to give the benefits of vegetables to your kids do not forget to add noodles, macaroni or any other favorite stuff of your kids in the soup. You can also make stuffed Parathas with potatoes, carrots, peas, radish, cauliflower and many other vegetables. Please visit our recipe section to get some wonderful and easy recipes for your kids. •	Always keep some handy snacks for your kids like baby corns, cherry tomatoes, baby carrots, strawberries, cherries and any other raw vegetable which you can offer your kids when they feel hungry. 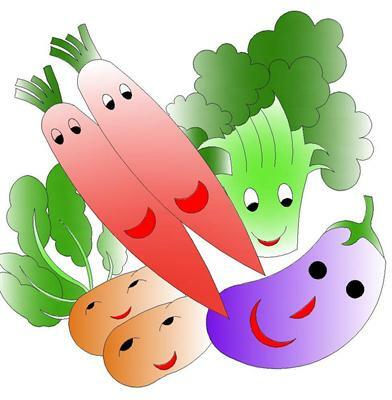 •	Be creative do some art work on vegetables and fruits to encourage children to eat their vegetables and try new ones. You can encourage your kids to make their own vegetable art work. •	Take your kids with you for the shopping of vegetables let them choose the vegetable and pay money for them so that they will understand the values of vegetables. Also take their help in cooking food if you have small kids than let them wash the vegetables, older kids can help in cutting or chopping the vegetables. 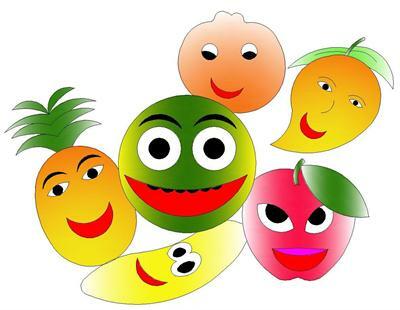 •	Vegetables games for kids are also a good idea to make vegetables and fruits fun for your children. There are many games which you can play with your kids to teach them the importance of vegetables such as veggie bingo, make flash cards having beautiful picture of fruit and vegetables, you can also make cards in which you can show the favorite cartoon character of your child eating vegetables and fruits. Try these ideas and tips to teach your kids the importance of eating vegetables in a way they will enjoy. Do not force your kids just be patient in developing the eating habits of your kids so that they will enjoy their food. This is a great resource that can never be overlooked because it looked into the children's vegetable eating habits. Eating vegetables and fruits by the children enhances their chances of growing very well without been disturbed by diseases.